Become an Excel Dashboard Expert : 11 Basic, 3 Intermediate and 4 Advanced Level Dynamic Dashboards without any VBA code. 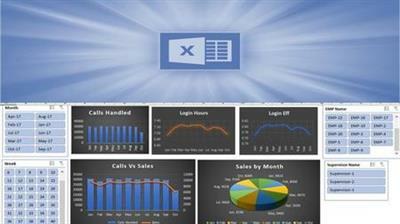 The Art of creating Visually Stunning Excel Dashboards. You will start with 11 Basic Level Dashboards and gradually move to 3 Intermediate and 4 Advanced Level Charts. Practicing the charts along with the course will make you a Master of MS Excel Dashboards. Basic Working Knowledge of Microsoft Excel. Knowing basic funtions in Excel. This course teaches you to create well-designed dynamic Excel dashboards so you and your colleagues can see trends and make quick decisions informed by data. By participating in this Microsoft Excel Dynamic Dashboard course you’ll gain the widely sought after skills necessary to effectively analyze large sets of data. In this topic, we’ll discuss how to use multiple PivotTables, PivotCharts and PivotTable tools to create a dynamic dashboard. Then we’ll give users the ability to quickly filter the data the way they want with Slicers and a Timeline, which allow your PivotTables and charts to automatically expand and contract to display only the information that users want to see. In addition, you can quickly refresh your dashboard when you add or update data. This makes it very handy because you only need to create the dashboard report once. You will start with 11 Basic Level Dashboards and gradually move to 3 Intermediate and 4 Advanced Level Charts. Practicing the charts along with the course will make you a Master of MS Excel Dashboards. This course is meant for students who wish to create beautiful Dynamic Dashboard using MS Excel for Data Visualization and Analysis. Anyone who would like to take his Excel Skills to the next level.